I love callling someone crackers, as in crazy kooky nuts. This however is CRACKERS! I made them last night after bedtime and before Italian gardens was on at 9. It hasn't been on in ages- ha and look at that, its on you tube of course- but I was so exited to see it on the tv and had an hour to kill, so crackers it was! I have been wanting to make them for a while as part of my "You mean I can actually make that myself?" campaign, which is an offshoot of my "Holy crap I need to save money till I can get a job" program. I got the recipe off pinterest and here, 101 cookbooks. They're great! Lovely with the hummus I made to go with them. Triumph! If Finch likes them, it will be even better. I even got to finally use my ravioli cutter that I must have bought 15 years ago in a moment of inspiration. It was very effective. Oh and a super quick sketch for "What I wore Today drawings" on Flickr. Don't you just LOVE these ones by Kittyvane?? I love them! I have never actually KNOWN what mochi was until last week. I was at my grocery store and, lo and behold! "Japanese Style Green Tea Mochi- made in Taiwan". I grabbed a box and tried it at home. It has the most delightful squishy texture- SO squishy and soft and pleasing to hold, a bit funny to eat but all in all a good experience. I am a big fan of textures in food- I love chocolate with rice krispies in it, I am crazy about slippery noodles in pho soup ( sorry Krissy -lol!) and I love food in its own packages- ravioli, burritos, dumplings, spring rolls, perogies! So there you go- Mochi- yum! 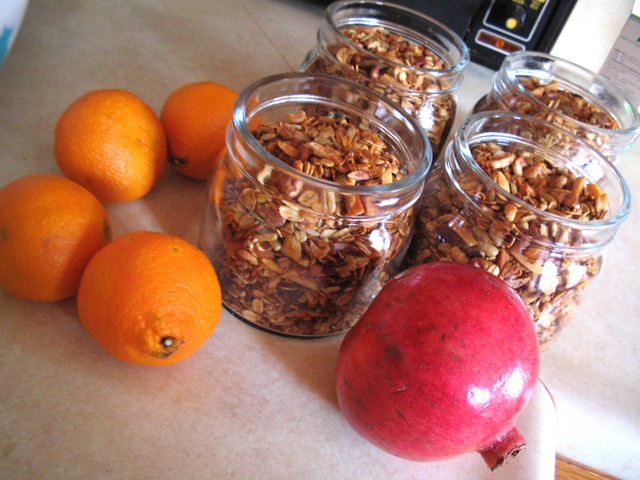 Ever since I saw the post on Little Birds about home made granola, which included a recipe, I have been making it for us here at casa t & p. This coincided with the getting of a gift of homemade granola as a housewarming thing. It was so yummy. So Now I am hooked, I finally have a breakfast that I really enjoy eating day after day ( I have it with yogurt and berries) that is also healthy too, unlike toast which is just fine but gets a bit dull and too sweet with the jam I like. Anyway, here is a fresh batch made this morning to be given to my immediate co-workers. I am feeling a bit scroogey about gifts this year which is due to mostly discovering that we have way way too much stuff and so who needs to recieve more? I am all over food as gifts but we will see how far I get with that. I am also feeling a tad LAZY this year as well. Deck the halls! 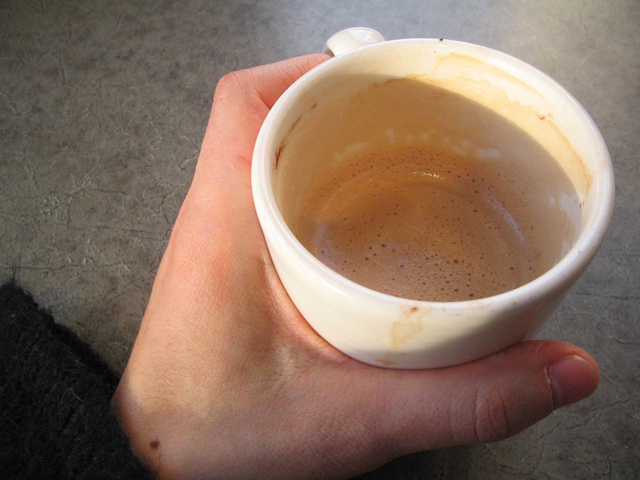 This is a picture of one of the last cups of coffee I intend to have for a while. At the time I did not realise it would be one of the last and I did not treat it as such. I was just a bit early for work after running various errands so I treated myself. But this is it!! A caffeine break! I am completely not exited about it. I need coffee to get exited. I love my coffee and my tea but what the heck, time for a break. I will buy that instant "coffee substitute" drink made of acorns and barley I saw at the store. MM! Visit Tania's profile on Pinterest.